A man who listed his beat-up old watch on eBay for ten bucks was shocked to discover that it was an extremely rare Rolex model that appeared in classic James Bond films and was actually worth a big pile of cash. Back in the late 50s, a U.S. Navy man by the name of Bob purchased a watch from the Navy Exchange on Kwajalein Atoll in the Marshall Islands. He didn't buy it because it was a classy Rolex, but because he needed a dive watch to time his air reserves and that's what the store happened to have in stock. He blew $70 on it, a fairly hefty price tag at the time; his wife, apparently, was not happy. Bob wore that old watch for 35 years before finally retiring it to a drawer, where it sat for another decade. Then, a couple of weeks ago, he decided to list a few of his things on eBay, maybe for a little extra cash to blow on Christmas gifts. Whatever the reason, he obviously wasn't expecting much because he started the bidding on his banged-up timepiece at $9.95. He began to grow suspicious after bidding broke the $30,000 mark. Yes, that's thirty thousand dollars. 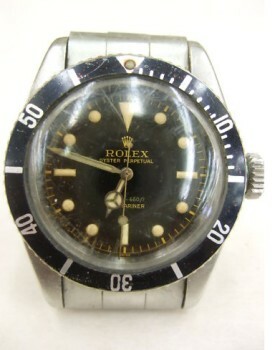 He and his son did some research and came up with a startling discovery: this wasn't just any old dive watch, this was a Rolex Submariner Ref 5510, described by Crunchgear as the "holy grail" of watch dorks. It's apparently the "rarest and most sought-after" version of the watch and is the same model Sean Connery wore in the James Bond classics Dr. No, Goldfinger and Thunderball. Bob acknowledged in the auction listing that he doesn't have any of the original papers, which makes sense in light of the fact that he wasn't treating it as an investment, so in lieu of that he provided a less precise but far more personal provenance for collectors: photos of himself wearing it throughout the years, including a rather bizarre shot taken at what appears to be some kind of party with Christopher Reeve, aka Superman, doing the dishes. In the auction listing, Bob said he and his wife are downsizing and that he hoped to be able to get $50 or $100 for the thing. The final selling price when the auction closed on December 4: $66,100. Nice.